On 11 December, the findings of Ukraine’s first survey on public attitude towards innovations and AI introduction in various sectors were presented in Kyiv. The survey called "AI: Ukrainian Dimension" was conducted by Gorshenin Institute at the request of and in collaboration with Everest Group. A total of 1,000 respondents aged 16 to 65 years were interviewed face-to-face at the place of their residence in all regional centres of Ukraine (excluding the occupied territories of the Autonomous Republic of Crimea, the city of Sevastopol, Donetsk and Luhansk regions; the survey in Donbas was limited to Mariupol and Severodonetsk). Participants in the survey were grouped by region, gender and age. Coverage error does not exceed +/-3.1%. According to the survey, the majority of Ukrainians (73.3%) are interested in innovative technology. Out of this share, 33.4% pointed out that they are certainly interested in the subject while 39.9% said they were rather interested. In addition, despite the widespread discussions about the potential risks associated with the use of AI, almost half of the respondents (45.5%) said that they were even prepared to entrust AI with the organization of elections and vote count. A total of 42.3% of Ukrainians would also entrust AI with control over government spending to prevent corruption, 52.0% would welcome the use of robots in construction, 46% in manufacturing and 39.1% in education. The survey findings, however, clearly show the challenging nature of interaction between the human factor and innovative technology at the state level and Ukrainians' unwillingness to acknowledge the effectiveness of innovations in this sector. In particular, the respondents named politics and management among the most inappropriate sectors for AI application (40.1%). Yet, the majority of the respondents (61.7%) believe that Ukraine needs its own national strategy for AI development. This clearly shows that Ukrainians are not just interested in innovations but are ready for specific actions on the part of the government, among others, on the ubiquitous introduction of AI. According to the Ukrainian experts who presented this study to the public, business and government officials, the solution of many key issues in education, economy, healthcare, business, science and society in general will depend on the government’s willingness to take action to promote this concept. Today the innovative development in Ukraine is primarily based on managers' priorities and their willingness to cooperate in order to create an innovative environment. A National AI Development Strategy will allow us to formulate the key cases of interaction between the government, business, scholars and R&D and open up the existing HR and technological potential of Ukraine. It should be noted that, given certain features of national start-ups, Ukrainians are ready to both invent practices from scratch and integrate the already tested ones, implement them directly or simply make active use of technology. However, these products will be relevant and appealing in the country and abroad only if there are proper conditions available. The experts insist that this requires a systemic discussion of the strengthening of investment injections and formation of an effective public-private partnership. The next important step should be the consolidation of approaches to the development and use of innovations at the legislative level the way it is currently done in the West. The Ukrainian experts also insist that a reasonable state policy of attracting Western investment can break the deadlock the Ukrainian market of intelligent technology is in. Education is the most suitable sector for innovative transformation due to its focus on human resources and professional training. In general, the fact that more than 80% of the respondents noted the positive impact of AI on society and its activities holds out hope, in particular, for the Ukrainian commercial sector, still the biggest driver of the country's technology market. For details of the survey, please click on the link. 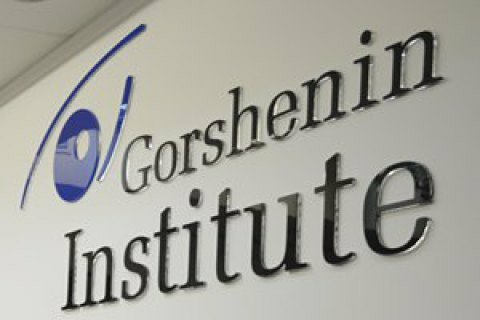 Gorshenin Institute is a leading Ukrainian think tank focusing on political and social processes in Ukraine and beyond. The Institute organises communication platforms, holds sociological surveys and produces analytical materials on the most relevant issues concerning national security, political and economic life. It develops recommendations on how to mitigate risks, relieve tension in society and facilitate a more efficient interaction between business, the state and society. The Everest group of companies is an integrator of innovations for business and society. It develops and rolls out advanced information technology, products and services in commercial and public sectors, as well as in national security and defence. Over the 26 years of operation, the company has successfully implemented more than 500 projects. Everest's technical solutions, software and equipment are used by industrial enterprises, financial and medical institutions, communication companies, the Ukrainian Armed Forces, the National Guard and the Ministry of Internal Affairs. Everest‘s innovative development and implementation projects are based on its team expertise and competence, as well as the best achievements of the world's leading companies in civil and military industries, allow the company to offer solutions tailored to the Ukrainian market. Everest's international partners include Intel, Cisco, Microsoft, Harris, Aselsan, HPE, Asus, Apple, APC, Eaton and Dell.